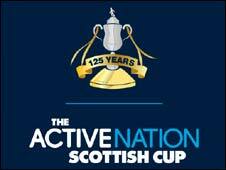 Cowdenbeath and Alloa fought out a goalless draw at Central Park in the fourth round of the Scottish Cup. Alloa keeper David Crawford pulled off two good saves to thwart headers from Gareth Wardlaw and Scott McBride. Cowdenbeath had a let off in the 13th minute when a Chris Townsley header was cleared off the line by Craig Winter. After the interval Wardlaw was twice denied by the in-form Crawford, who clawed away a 30-yard fizzer and stopped another fine strike. Cowdenbeath: Hay, Droudge, Armstrong, Mbu, Adamson, Ramsay, Winter (Ferguson 71), Robertson, Stein (Linton 68), Wardlaw, McBride (Fairbairn 71). Subs Not Used: Baxter, Bower. Alloa: Crawford, Buist , Townsley (Carroll 68), Walker, McClune, Gilhaney (Agnew 81), Brown Ferguson, Brown, Noble, Scott, Grant. Subs Not Used: Phelps, Kerr, Hillcoat.